Unit heaters: wall- and ceiling-mounted units. Fast delivery service: All unit heaters with copper-aluminium heat exchangers and 2-stage, 3-phase motors are available ex-stock. 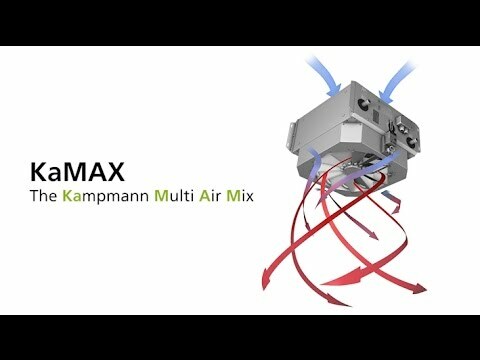 for KaMAX, flap adjustment, both directions, 230 V, protection class IP 54. TIP unit heaters can be installed as standing or suspended units. For which kinds of operation and where can these units be used? TOP unit heaters can be used for recirculating air and for mixed air operation. They are therefore ideal for the optimum decentralised heating and ventilation of production plants, warehouses and many other buildings in industry and commerce. Special heat exchangers with a low exchange capacity are available for use with low water temperatures. What models of TOP unit heaters are available? TOP unit heaters can be combined with a whole range of different models of fans and heat exchangers. Single-phase and three-phase fans are available, with the 3-phase fans also being available as explosion-proof fans. All of the fans are 0-100% controllable. TOP unit heaters can be selected with the most appropriate heat exchanger, depending on the heating medium being used and the area of use. While copper/aluminium heat exchangers can be operated cost-effectively in areas with normal air pollution, steel heat exchangers should be used anywhere that particularly durable heat exchanger are required or with steam and crossflow heat exchangers for wide temperature spreads. Can the installed output of the heaters be greater than that of the boiler output? Yes. If the boiler is overworked, the flow temperature drops until the hear output of the boiler and the output of the units is identical again. This frequently happens in the morning when the units are being heated-up for the first time and the entire building is switching over to day mode.